On the heels of a successful inaugural season, AXS TV’s original reality series Real Money—starring chart-topping rock musician Eddie Money and his family—has received an order for a 12-episode second season, up from 10 episodes in the initial go-round. 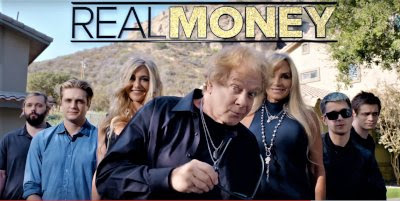 Real Money joined fellow AXS TV original Rock & Roll Road Trip With Sammy Hagar in the Sunday Night Rocks block, delivering a powerhouse duet that hit all the right notes with the classic rock audience and cemented the two series as the most popular original programs in 2018, along with The Big Interview with Dan Rather. The second season of Real Money is slated to air in early 2019, with production commencing in the summer. Picking up where the first season left off, season two will feature the return of the entire cast—featuring Eddie Money, his wife Laurie, and children and bandmates Jesse, Dez, and Julian—as they tour across the country, performing Eddie’s signature hits to packed venues. The upcoming season will include guest-star surprises and all-new music from Eddie, Dez and Jesse, while also following new career pursuits for sons Zach and Joe. As of right now, the Money family, only has eight dogs and one cat. But, by the time of filming, the animal-loving homestead may take in a few more. With a legendary career spanning over 40 years, Eddie Money has long-established himself as one of rock’s most beloved entertainers. After leaving his native Brooklyn for the Berkeley music scene in the 1970s, Money quickly rose to fame on the strength of a slew of successful albums and Top 40 hits including “Take Me Home Tonight,” “Shakin’,” “Think I’m In Love,” “Baby Hold On,” and many more. Now, at 69 years old, Money continues to tour across the country with his band, which includes three of his equally talented offspring. Real Money is produced by Enchanted Media.